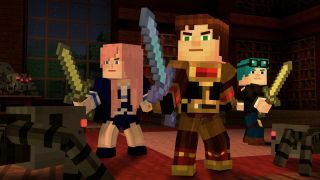 We knew Telltale wasn't finished with Minecraft Story Mode but now it's unveiled what new blocky fun awaits. Not only are there three new episodes starting next week on June 7, there's also going to be some special guest stars. Famous members of the Minecraft community on YouTube, Stampy Cat, The Diamond Minecart, LDShadowLady and CaptainSparklez will all be in there as characters to play alongside, voiced by their real life counterparts. Episode 6: A Portal To Mystery will follow Jesse/Jessie and his team as they end up in a mysterious new world full of zombies. It's here, as they hole up in a haunted mansion, that they'll meet the special guests. There's no info as to when the next two episodes will drop but, as usual for Telltale Games, Episode 6 will be available on PS4, Xbox One, PS3, Xbox 360, PC, and both the Android and Apple app stores on June 7. It'll be $4.99 to buy standalone or the Adventure Pass, which includes all three, will be $14.99.